Although I cook a lot, I hardly ever use cookbooks. But when a friend of mine releases a cookbook, I make an exception. Fellow Brooklyn vegetarian and blogger Chitra Agrawal, owner of Brooklyn Delhi, has a new cookbook out. Vibrant India is a natural extension of Chitra’s mission to marry the flavors of India with a uniquely Brooklyn aesthetic. With a few specialty pantry ingredients, such ad black mustard seeds and hing (aka asafoetida), the home cook can transform local ingredients into great Indian dishes. I wanted to start with a few simple dish, with ingredients I had on hand. The stir-fries, or palya, seemed like a logical starting point. First up is a potato stir-fry (alugedde palya) with onion and ginger. The potatoes are simply boiled and then cooked with onions. In addition to the spices mentioned above the cooking oil is seasoned with curry leaves and a bit of ginger and chilis, and this incredibly flavorful oil permeates the entire dish. 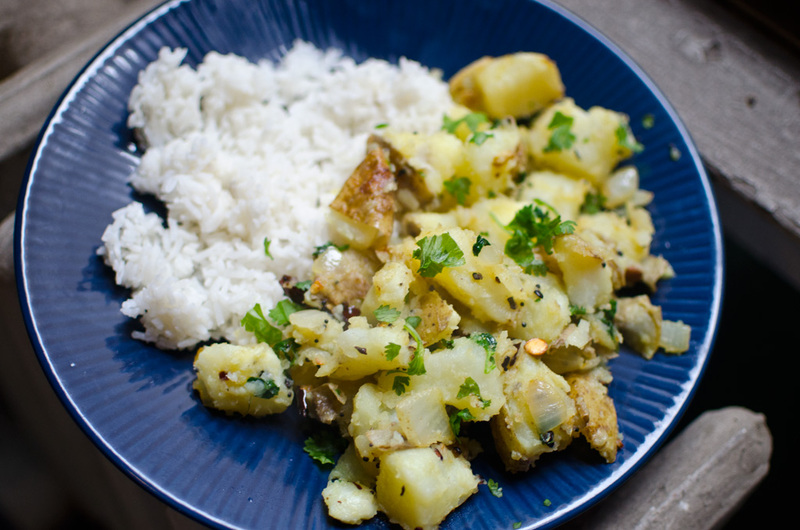 I ate the potatoes with some simple rice, but the book mentions that you can use the same mixture to fill a dosa (there’s also a recipe for how to make the dosa in the book). Next I tried the cabbage stir fry with lemon and curry leaves (yalekosu palya). Although there were similarities with the potato dish this leaned more heavily on the smoky flavor of the curry leaves and the toasted dal (lentils) that get sauteed in the flavored oil. 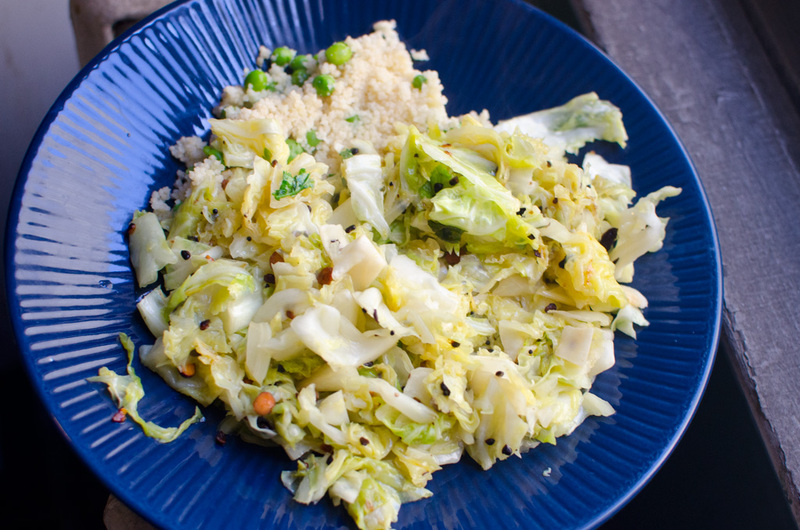 The cabbage is slightly wilted but still a bit crunchy, then tossed with dried unsweetened coconut, and finished with lemon juice and cilantro. There are a wide variety of recipes in the book — salads, breads, desserts, etc — and some are more complicated than others. I’m looking forward to cooking my way through most of them. This entry was posted in cooking and tagged cooking, indian, vibrant india. Bookmark the permalink.